A little lord deserves the finest of garments to wear. This Boys Lace-Up Medieval Shirt suits that need perfectly, allowing them to look like the most hard-working of serfs, the most noble of knights, and the most high of kings. This shirt is made entirely from fine linen fabric, which is light and comfortable to wear, making it a stellar warm-weather choice for fair season and reenactments. The shirt features a folded, flat collar around the neck, as well as lace-up closures along the shirts center line, as well as on its full length long sleeves. The center of the shirt can be tied at the collar or at the bottom, if you wish to invert it, while the sleeves tie at the cuff, allowing for an immense degree of customization and change. 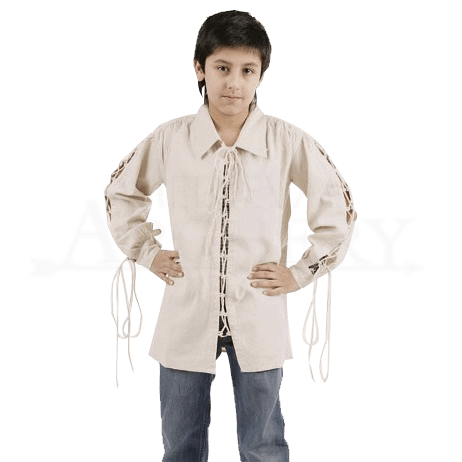 The shirt is offered in either a natural white hue or a black coloration, and it comes in three sizes, which are designed to fit boys of differing ages. 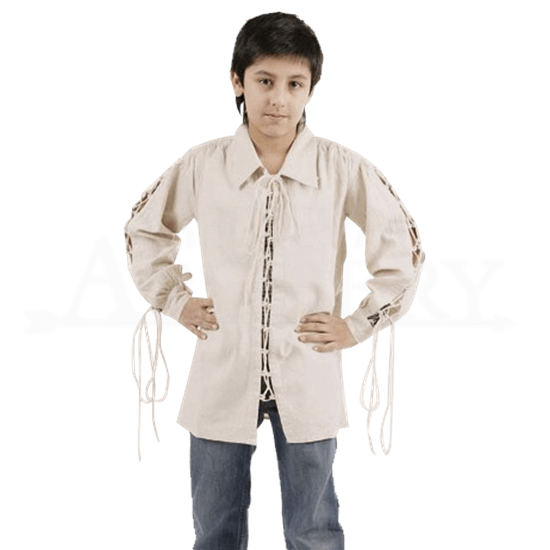 It is a versatile garment, and that is what makes this Boys Lace-Up Medieval Shirt a must-have piece for any young man to own and wear, when it comes to making their own ideal medieval and Renaissance looks.